In 2016, the U.S. Coast Guard reported 4,463 recreational boating accidents nationwide. These serious incidents resulted in 701 deaths, 2,903 injuries and approximately $49 million dollars of property damage. The causes of these accidents vary, but boating injuries are often due to the negligence of boat operators, passengers and other unexpected factors. 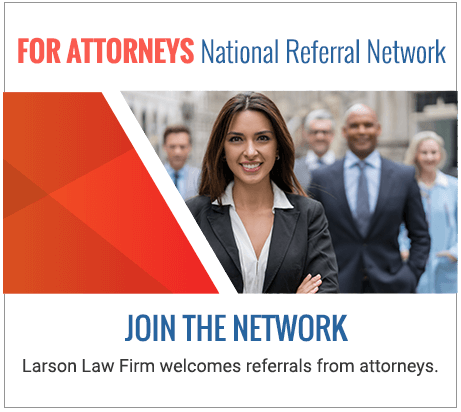 The experienced North Dakota boat accident attorneys of Larson Law Firm P.C. are trusted allies for individuals who have been injured in an accident due to someone else’s negligence. We understand that accident injuries can diminish your quality of life, leaving you angry and feeling helpless. As your dedicated legal consultants, we fully commit our resources and skills to recovering maximum monetary damages on your behalf. In the warmer months, it is not uncommon to see water skiers, boaters and swimmers out on the lakes. Whether you are taking a dip in Beaver Lake, firing up the pontoon on Devils Lake, or taking your kayak down the Missouri River, you will have to maneuver around countless other vacationers doing the exact same thing. The number of deaths and serious injuries from boating accidents increased between 2015 and 2016. As reported by the Coast Guard, the rate of deaths increased by 12%, while the rate of injury increased by about 11%. Of the deaths reported in 2016, 80% involved drowning, and 83% of those drowning victims did not wear a life jacket. Improper life jacket use is a leading cause of fishing boat accident injuries. It is the responsibility of the fishing boat operator to ensure that state boating regulations are followed. When he or she ignores the law and causes injury, our knowledgeable team is there to fight for the rights of the victim. We understand the dramatic impact that fishing and recreational boating accident injuries can have on your daily life and the well-being of your family. Painful injuries can linger, creating long-term health complications and financial hardships. That is why our injury attorneys work hard to obtain compensation for your injuries. If you have been injured in a recreational boating accident, count on the Larson Law Firm P.C. to guide you through every step of the process. Whether filing a personal injury claim or litigating in the courts of North Dakota, our experienced attorneys have the knowledge and skill to fight for your interests and hold negligent parties accountable. From our office in Minot, we earnestly represent clients throughout Ward, Williams, McKenzie, Pierce and Mountrail Counties. Call us today at 701-484-HURT or complete our contact form to arrange a free consultation.